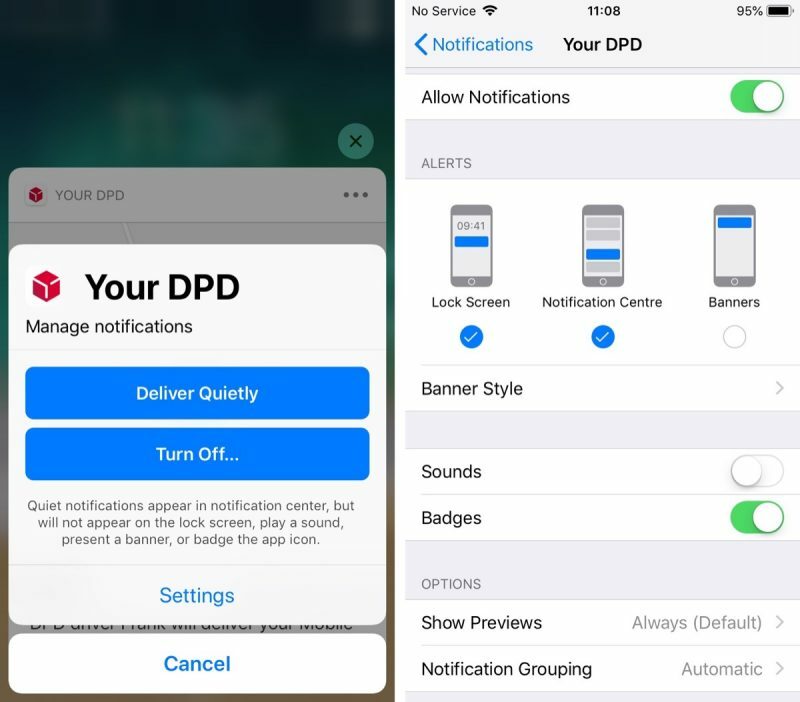 As part of its digital health initiative in iOS 12, Apple has introduced some improvements to the way app notifications can be managed, enabling users to more easily reduce the number of daily distractions their iPhone or iPad throws their way. One of these new features is called Instant Tuning, which allows you to quickly adjust the future behavior of app notifications whenever they appear in the Lock Screen or the Notifications Center. Here's how to make the most of it. Next time an alert appears in your device's Notifications Center or on the Lock Screen, swipe left on it, then tap Manage. Alternatively, if your device supports 3D Touch, hard press on the alert and then tap the three dots in the upper right corner of the expanded notification. A Manage Notifications pop-up will appear on the screen featuring two blue button options. Deliver Quietly ensures future alerts from this app only appear in the Notification Center (accessed by swiping down from the top of your device's screen). Note that selecting this option means alerts will no longer show in the Lock Screen and you won't see any banner notifications on any other screens. Deliver Quietly also turns off any sound or vibration alerts set for the associated app. 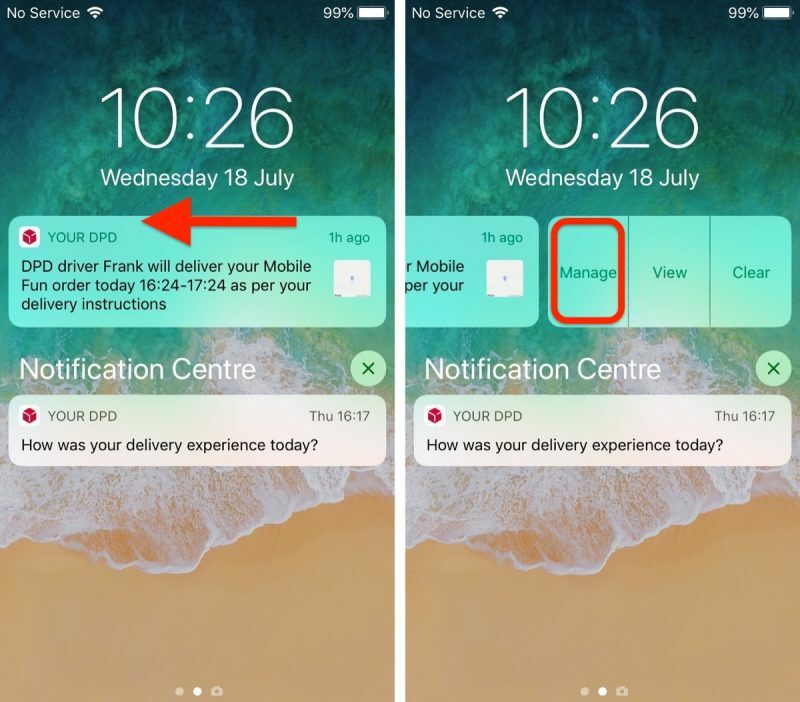 If you tap Deliver Quietly and then decide you'd rather not stick with the setting, open the Manage Notifications pop-up again in the same way and tap the Deliver Prominently button to reinstate the previous settings. The second option, Turn Off..., completely disables all notifications for the related app. Tap this button and you will be prompted to confirm it's what you want. Below the two large blue buttons is a less prominent Settings button that takes you to the individual app's various notification options, usually accessed via the main Settings app. From here you can adjust where alerts should appear (if at all), enable or disable sounds and badges, select alert preview options (Always, When Unlocked, Never) and choose how notifications should be grouped (Automatic, By App, Off). Why on earth would you want quiet notifications? The only difference between quiet notifications and no notifications is that quiet notifications adds them to a hidden app with no proper UI. The only time I ever open notification center is if I saw a banner that I was reading that hid itself too quickly. Without having it appear on the lock screen or as a banner, I'd never even know to open notification center to look for anything. Is it really so hard to imagine? There are plenty of things that I'd like to know about but are not time sensitive and therefore do not wish to bother me with a chime or alert. I'm wondering when they are going to redesign iOS. Look at the DPD buttons. Two blue, two plain at the bottom. So much text. Sometimes it strikes me as odd. Nifty feature. Agree about the redesign. I’ve never liked the look of Jony Ive’s iOS, although it’s improved as time has passed. Yes, I get that you don't want to be bombarded with banners and sounds. In that case, you set the app to only display the badge on its icon, which Quiet Notifications disables. With the badge, you know how many notifications you have waiting for you in the app, plus that little reminder that the app exists and has useful data. And then you launch it and it has a nice UI for showing you whatever it has. With Notification Center, you don't know what's in there until you open it. You have no reminders that it exists or that it needs to be checked. And should you open it, the UI is garbage. Checking your email from a command line has a better UI than Notification Center. So... don't use Quiet Notifications. Problem solved. I myself will probably for some things, but you are definitely not being forced to. Surprise! Different people use their phones in different ways. I’m loving this feature in the beta. I’ve changed most of my notifications to Deliver Quietly. I’m definately less distracted as a result, and when I want to catch up on what I’ve missed I just swipe down to reveal Notification Center and everything is there in one place. I can then either tap to open the relevant app or just dismiss the notifications if they’re not worthy of my time. A reasonable assumption would be that if a rational person enabled Quiet Notifications for some Apps, they would periodically open Notification Center at a time of their choice when convenient to check for those Notifications, much like I periodically open email to check for mail since I have push/timed pull disabled (or else I would get non-stop email notices). I’m sensing this is sarcasm. What are your thoughts on options on Windows, spread between Control Panel, System Properties, and Regedit (plus a few other programs?) with no rhyme or reason to any of it, plus no explanation of what most of it does? Increasingly I feel iOS is becoming the same thing. Thank goodness all the options are in one app, but I’ve given up on trying to learn what all the options are. I remember a few years ago with each iOS release I would go through all the menus to learn everything I could customize. I don’t anymore. Too daunting. Too much there. I don’t understand a lot of it. Apple/iOS was supposed to be the simple one. Android was there if you wanted endless piles of options. Apple was supposed to make the obvious choices for us and just give us a few things that were purely subjective - IE, wallpaper. I agree, I think that the iOS settings need to have a UX makeover as they’re getting complicated and confusing regarding where everything is, as you mentioned. Also, for a few years now, it’s not been obvious if an app’s settings are in the app itself or in iOS settings. Commonly system wide settings for the app are in iOS settings (notifications and privacy etc) whereas app specific settings are in the app itself - but sometimes they are all in iOS settings, depending on what the dev decides. You try and explain all of that to your parents! My parents aren't a problem. My dad is as up on this as I am, and my mom refuses to ever upgrade anything or use it to it's full potential. It's my in-laws that are a problem. They want to upgrade and keep up with everything, but they don't do it on their own, so they ask me for assistance. The only time I ever open notification center is if I saw a banner that I was reading that hid itself too quickly. Without having it appear on the lock screen or as a banner, I'd never even know to open notification center to look for anything.